Can I Use Ultimate Music Theory? 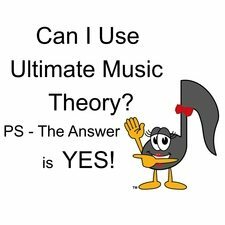 When I am asked "Can I use Ultimate Music Theory", it is almost always followed by a "Because..."
Because my students use the TMTA Examinations (Texas Music Teachers Association). Because I'm a member of the MMTA (Minnesota Music Teachers Association). Because my students take Conservatory Canada Examinations. Because my students don't take any Piano or Theory Examinations. Because I don't teach Royal Conservatory of Music. Guess what my answer is...every time? You got it - YES! Music Theory is music theory. You can use Ultimate Music Theory Workbooks to successfully prepare for every Theory Examination that I've ever seen in any theory program that I have ever seen. We have incorporated mnemonic devices for better memory, along with accelerated learning techniques that make learning theory easy and exciting! And... no matter where you live or what method you use, theory is theory! When I Use Ultimate Music Theory, What Might be Different? I'm a Canadian. I live in Ontario. When I visit friends in the States, if I order Fish and Chips, I get Fish and Potato chips. In Canada, when I order Fish and Chips, I get Fish and French Fries. I order Pop in Canada, I order Soda in the States. Moral of the story - sometimes things are called something different, but it is the same thing! When you use Ultimate Music Theory, you will see that we have used (brackets) when there is more than one typical name for a concept. Raise the following notes a chromatic semitone (half step). Lower the following notes a whole tone (whole step). Write the following solid (blocked) triads in Root Position. PS - "Rudiments" is just another fancy way of saying "Theory"! Do you see the terms that are different? That's right - the Major Difference is semitone/half step, whole tone/whole step and solid/blocked. However, by the time you have introduced the concepts, and you have seen all the acceptable terminologies dozens of times in their Workbook, you and your Students will be "bilingual"! You will be able to speak theory in Canadian and in American. In Europe, a whole note is called a semibreve; a half note is a minim; a quarter note is a crotchet and an eighth note is a quaver. Some countries use fixed or movable Doh (or Do) instead of the Musical Alphabet. But a note with a filled in black note head and a stem still receives 1 beat - no matter what it is called. The white key in the middle of the 2 black keys has the same frequency of pitch (sound) no matter where in the world you are playing it (as long as your instrument is tuned! LOL!). You can play Fur Elise in French, German, Dutch, English, whatever...it is still the same music. And Theory, well, it is still MUSIC THEORY no matter what it is called or what language you speak. When I Use Ultimate Music Theory, What Book Should I Start In? My students start to use Ultimate Music Theory when they are in their first months of piano lessons. I use the Ultimate Music Theory Prep 1 Rudiments Workbook along with the method that I have chosen for the student (based on their learning styles, leaning needs and commitment level). Completing one to two pages of UMT Theory then becomes part of their normal practicing habits. For my beginners, one of the best things that I can do is order the Prep 1 Student Pack for them to use. 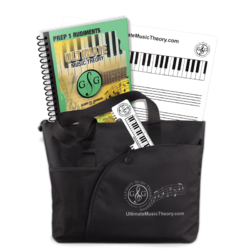 This gives them their Prep 1 Rudiments Workbook, their UMT Whiteboard (with eraser and dry-erase marker), their UMT Ruler (which they can also use as a bookmark) and their UMT Tote Bag (which holds all their books - piano, voice and theory! However, if you have a student with a few years of piano under their belt and you are not certain where they should start, check out our Music Theory Overview. You can print off a great comparison chart to see what theoretic concepts are introduced in which books. You can also review the contents and concepts of each workbook. Still not sure which book to use for your more advanced students? Then print off the Free Downloadable Exams! And you should complete the exams yourself! Why? Because you might just find out that you didn't know a concept yourself. And, learning new things is SO COOL! The answers for each of the free exams are under the requirements tab for each examination. Use the answers to mark your exam (and your student's exam). Why? Again - because you might just find out that you have been teaching a concept incorrectly yourself. And, learning new things is SO COOL! Start with the Preparatory Exam. Have your student complete the Exam. If they struggled in any way, or if any of their answers were different from the official Preparatory Exam Answers, please consider reviewing right from the beginning when you use Ultimate Music Theory! If you (and your student) found the exam easy, then continue with Basic! When I Use Ultimate Music Theory, Why Do I See "RCM"? "The Royal Conservatory Music Development Program (Music Development Program) provides a recognized national standard of musical success through an effectively sequenced course of study from beginner to advanced levels." The Ultimate Music Theory Workbook Series and UMT Exam Series is based on the RCM Theory Syllabus as the foundation for developing the content flow in the Ultimate Music Theory Program. Plus, we added MUCH MUCH MORE including accelerated learning techniques! Because once you start to learn about a concept, you get excited about the concept and want to learn more! When you use Ultimate Music Theory workbooks, you will quickly realize that it is not just a typical workbook. You will learn our exclusive step-by-step system that allows you to "get" concepts easily! 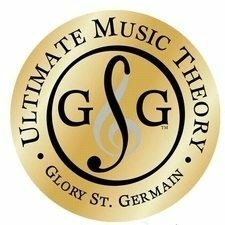 Should I Use Ultimate Music Theory When I'm Not Comfortable Teaching Theory? So, what should you do when you want to teach theory, but you are not sure where to start? 1. Take the Music Complete Theory Online Course. Work through the Complete Theory Workbook with Video Lessons that will cover all the tips to make understanding theory easy. 24 Step-by-Step Video Sessions and Online Support with Exam Marking & Certificate! Learn at your own tempo. You will fill in all the gaps in your own theory foundation (and remember - you don't know what you don't know until you discover that you didn't know it!). 2. Take the Ultimate Music Theory Certification Course! This is the only online Certification Course designed to teach you not only how to teach theory, but how to teach students of all learning styles. 50 Video Sessions, All Materials, Online Support, Exam Marking & Certificate! You will be able to apply your new knowledge to every single part of your teaching - theory, piano, voice, guitar, band, whatever! You will also learn how to teach Group Theory Club Classes that will open a new avenue of income for your teaching studio and a new avenue of learning for your students (and the lesson plans are included!). Remember - you CAN do it! You CAN use Ultimate Music Theory to become a better teacher. What are you waiting for? !